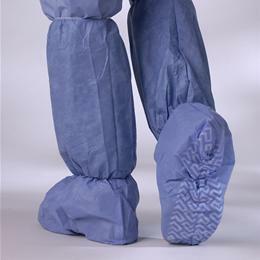 Non-Skid Sms-Poly Boot Covers: This Latex-Free Boot Cover Has Breathable, Fluid-Resistant Sms Material Above The Ankle, And A Fluid-Proof Polypropylene Coat Below The Ankle, Providing Maximum Fluid Protection. The Heat-Sealed Seams Reduce The Chance Of Fluid Penetration. The Tread On The Bottom Helps Provide Excellent Traction And Increases Stability. Knee High, X-Large Size (Fits Up To Men'S Size 15).